Remember those wonderful Lincoln logs we played with? Here’s a chance to build a virtual log cabin. Once the cabin is finished, students use the magic of their imaginations to go inside and see the furnishings of a real cabin. There’s a surprise at the end, when they look out the window and see a bear looking in! It’s a fun story that will be read again and again. Sound effects make this a particularly good selection for students with visual impairment. The reading vocabulary is grades 2-3. Log Cabin is the first in a set of five related activities. Immediately after reading the story, students are ready to proceed to the next two activities. Show What You Know About Log Cabin is a three choice per question comprehension test. Log Cabin Sequence uses the steps in building the cabin and the icons from the buttons in the building portion of the story. Students must reassemble the list of steps in the proper order. 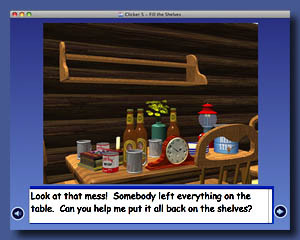 Once they finish the anchor book that brings the cabin to life, students go back in to help tidy up by putting various things back onto the shelves, again with realistic sounds. It’s important to give the comprehension test on Log Cabin before beginning this Fill The Shelves activity, because the things on the shelves will be different after this second trip into the cabin. Both the basic Log Cabin story and the follow-up Fill The Shelves are good exercises in following a sequence of instructions. above, between. This focus is reinforced in a follow up activity, Tell Me Where, in which students describe where on the shelf they put each item. Students choose the correct direction word from three choices on each page to demonstrate their mastery of these words. The two anchor books, Log Cabin and Fill The Shelves, can be read online in any web browser. 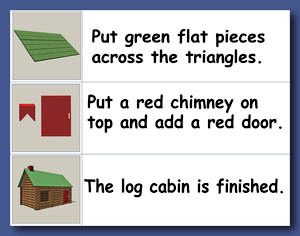 Follow up these activities with the two tests, Show What You Know About Log Cabin and Tell Me Where, in Word format, and the Log Cabin Sequence off-computer activity. There also is a desktop version of the two books that you can open and read with a web browser application. To see the movies, you would still need an internet connection. However, the desktop version speeds up loading pages significantly, since the still images, text, and sounds don’t require a wait for downloading. Links to the online books and for downloading the desktop versions are at the foot of this page. For both Classroom Suite® and Clicker 5®, the entire set of five activities is downloaded as a unit in zip format. The entire zip file should be installed from within Classroom Suite® in order to retain links to movies. There are custom IntelliKeys® overlays for each activity in the Classroom Suite® set. A zip file with Dynavox® versions of all the overlays is also available to download. See the Special Needs Access section on the System Reqs page for information on controlling the Classroom Suite® version from PRC devices. Decompress the zip file for Clicker 5® Log Cabin and copy the entire unit folders into the shared files. For details on installing Clicker 5® integrated study units, click here. Go to the Publish area to Import the My Own Bookshelf® and Test Me Score Me® activities. In addition to feedback sounds, the Log Cabin story in Classroom Suite®, Clicker 5®, and My Own Bookshelf® includes a movie to aid the student in imagining shrinking down small enough to go inside and another movie of going into the cabin. The Classroom Suite®, Clicker 5®, and My Own Bookshelf® versions of Fill The Shelves have realistic sounds as items are placed onto the shelves. The PowerPoint® version of Log Cabin does not include the movies, but does use the sounds, as does the PowerPoint® version of Fill The Shelves. There is a printable PDF version of both Log Cabin and Fill The Shelves, but these do not include sound effects. You can also use these on the computer. Use the buttons in the stories for navigation, instead of the arrows on the navigation bar. 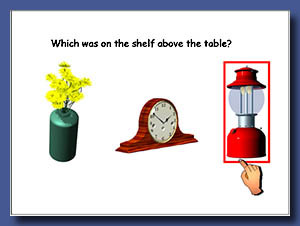 The “buttons” in the PDF of Fill The Shelves are actual clip art images of the items to put onto the shelves. The comprehension test and the Tell Me Where activity are included in the zip file for the Classroom Suite® and for the Clicker 5® study units. These same tests are supplied separately in Test Me Score Me® format to follow the My Own Bookshelf® stories. There are also Word® versions of these two tests, to follow the PDF and PowerPoint versions of the stories. A Log Cabin Sequence activity is a part of the Classroom Suite and Clicker 5 study units. There is also a printable version that could be be used as an off-computer activity along with the computer activities in any of the other formats. The off-computer version of Log Cabin Sequence is in PDF format, with the graphics and words for three steps on each page. These should be printed out in landscape mode, and then cut apart. In addition to using these graphics for sequence activities, you could separate the graphics and text for matching games. All the clip art from Log Cabin, including the construction button art, the various types of logs, and all the furnishings of the cabin, can be downloaded as a separate file. Log Cabin books link: logCabin/index.html Log Cabin and of Fill The Shelves books, linked by a menu page, to read online. Movies require QuickTime. Written in HTML5, so sounds should play on iPad. For details on using Annie’s Books Online, click here. Desktop version of Log Cabin books link: logCabinDesktop.zip (20 MB) Log Cabin and Fill The Shelves, linked by a menu page, to read from the desktop using a web browser. Movies require QuickTime. For details on using Annie’s Desktop Books, click here. LogCabin.pdf (3.6 MB) Log Cabin book to print. No movies. Acrobat Reader. FillTheShelves.pdf (2.7 MB) Fill The Shelves book to print. No movies. Acrobat Reader. LogCabinSequence.pdf (8.1 MB) Log Cabin Sequence activity to print and use off-computer. Acrobat Reader. 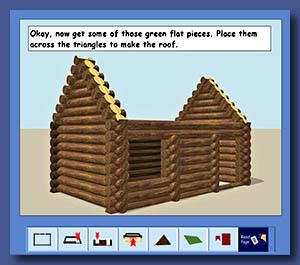 LogCabinSuite.zip (32.7 MB) All 5 Log Cabin activities in Classroom Suite v.3 or later. Install zip file using the Import button. Custom IntelliKeys overlays attached to each activity. LogCabinDynavox.zip (1.2 MB) (TITLE) Five Log Cabin activity overlays saved as Dynavox package files. Decompress zip file to use. LogCabinPowerPoint.zip (20.2 MB) Log Cabin and Fill The Shelves activities saved as .ppt and .pptx files. No movies. PowerPoint 2003 and PowerPoint 2007 versions for both activities in this single zip file. LogCabinMBS.zip (12.2 MB) folders with Log Cabin book and movies to import into My Own Bookshelf. FillTheShelvesMBS.zip (9.0 MB) folders with Fill The Shelves book to import into My Own Bookshelf. 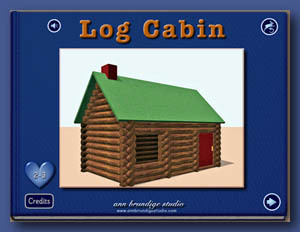 LogCabinCompTMSM.zip (3.0 MB) Test on Log Cabin story using clip art for answers. Requires Test Me Score Me. 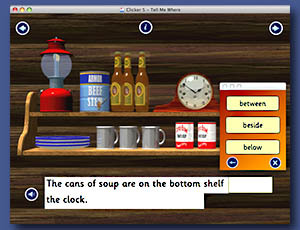 TellMeWhereTMSM.zip (5.1 MB) Fill the blank test on Fill The Shelves Story story with text answers. Requires Test Me Score Me. 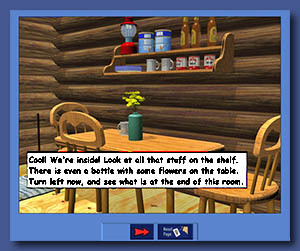 CabinCipArt.zip (1.8 MB) Clip art in JPEG format from Log Cabin and Fill The Shelves stories including the building the cabin button icons and all the furnishings of the cabin, plus the bear, naturally! To preview the collection, click here. As usual your work is awesome! I’m doing a Classroom Suite training this week and will demo this activity and your website. Thanks for this. All work here in the office stopped as everyone looked at Log Cabin – it is incredible and I can’t wait to show it to kids – the adults certainly love it! Thank you, thank you, thank you!